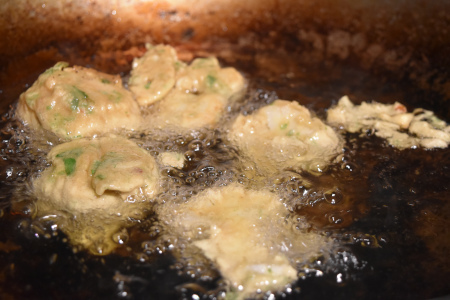 My cauliflower pakora florets are really easy to make and I cooked them outdoors in the wok of my Monolith kamado. The pomegranate raita dip adds to the presentation of this subtly spiced appetiser. I have to confess to being a sucker for anything deep fried and yes I know that it's maybe not what I should be eating every day but what's wrong with a treat every once in a while? That said, my wife used to hate me deep frying in the house because there was always a lot of spattering from the oil and the smell would linger after cooking. So now I deep fry outdoors with no complaints from the missus and that means that I can have my little fried treats without fear of retribution. The set up is straight forward on my Monolith kamado, direct heat with the bottom damper open just a very small amount to let some air to the fire. 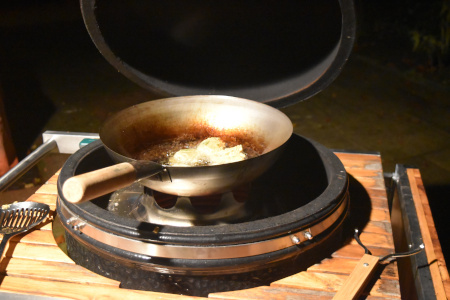 The wok stand sits either on your grill grate or directly on the fire ring and the wok sits on the stand. 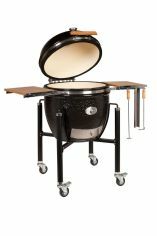 I prefer to leave the grill grate in my kamado so I can easily whip out the wok stand and get ready to grill whatever needs cooking next. I use vegetable oil in my wok and fill the wok until it is about one third full so there's no chance of the oil overflowing from the wok. Before getting the fire started however, the first thing to do is prepare the pomegranate raita. Note: You can turn this whole recipe vegan by substituting with soy yoghurt. Heat the vegetable oil in a small pan, add the cumin seeds and cook until they start to pop. Pour the yoghurt into your serving bowl, take the cumin seeds off the heat and stir into the yoghurt. Season with salt and pepper, add the pomegranate seeds and stir. Place the bowl in the refrigerator for an hour or so to give a little time for all the flavours to mingle. Smaller florets are easier to fully coat in batter. If not fully coated you'll end up with a oily offering. 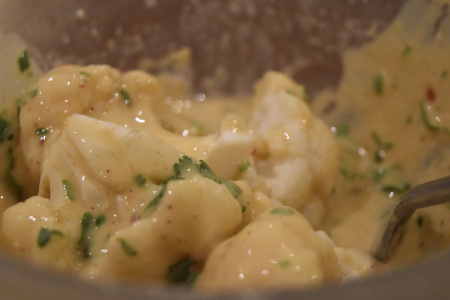 Bring a pan of water to the boil and blanch the cauliflower florets for 2 minutes and drain. In a mixing bowl add the gram flour, spices and season with salt and pepper. Next add enough cold water to make a thick batter. Fill your wok ⅓ full with vegetable oil and heat until you reach a temperature of about 150°C (300°F), dip your cauliflower florets in batter to ensure that they are fully coated, shake off any excess then fry in batches until puffed, crisp and golden. When cooked, drain on paper towel and the serve your cauliflower pakora florets with the raita.